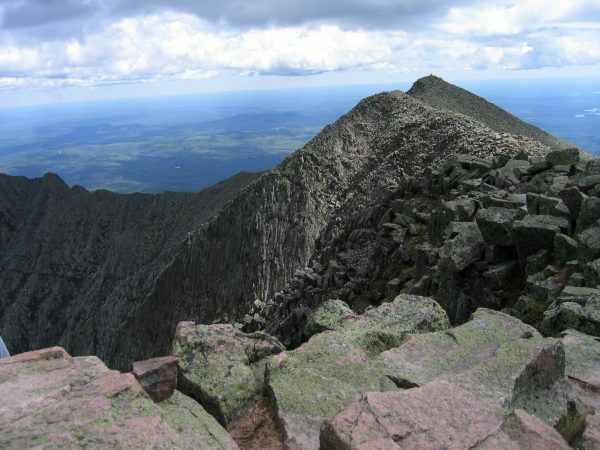 As we get ready to start a new hiking season, both hikers and maintainers might enjoy this piece I wrote in honor of Katahdin guide and caretaker Roy Dudley after finishing a complete section hike of the AT in 2008. Enjoy! So Beaver went to the low country and found Hiker, who was enjoying a long zero day, lying on his sofa and eating a Snickers for dessert after a gobbling down Ramen noodles and Slim Jims. 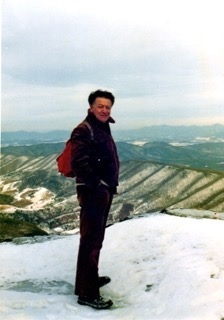 One man who answered the call of our mountains was Dr. Siegfried J. Kolmstetter, who joined the Roanoke Appalachian Trail Club in 1971 and passed away on February 13, 2019. He and his wife Ursula maintained the McAfee Knob section of the AT for over 25 years.They came to the Roanoke Valley in 1970, where he worked at the Veterans Administration Hospital in Salem for 28 years. The VA hospital recognized Siegfried with its “Hands and Heart” award on February 14, 1992 for his compassionate attitude and unselfish service on the behalf of veterans. March 16, 1971. Siegfried leads Brownie troop to McAfee Knob. On March 16, 1971 – the same year he joined RATC – Siegfried led his first hike to McAfee Knob, guiding a Brownie troop and their leader to the summit. 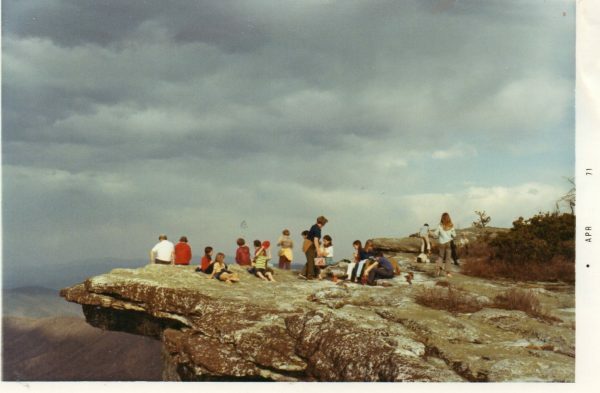 On March 1, 1978, problems with some local landowners forced the relocation of the AT away from McAfee Knob and on to North Mountain. This situation did not last long, and on January 24, 1982 Siegfried joined Charles Parry, Andy Layne, Mac McDaniel and Larry Wood in brushing out the first mile of the new trail back to McAfee Knob. 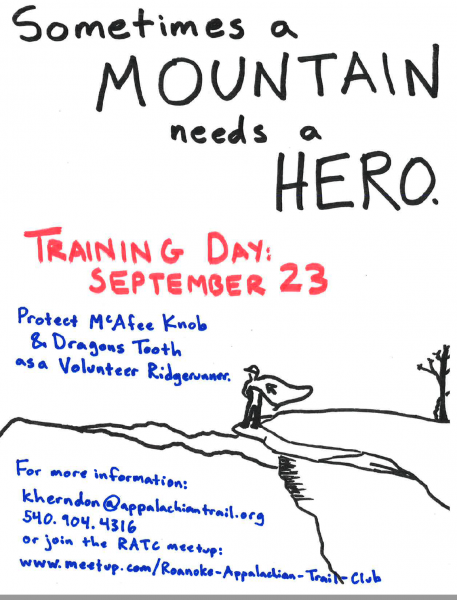 The Roanoke Appalachian Trail Club is looking for new volunteers to protect McAfee Knob and Dragons Tooth as Volunteer Ridgerunners. The first Training Day of 2019 will be Saturday, March 23 from 9 am to 4 pm. Please email Kathryn Herndon-Powell or call her at 540-904-4316 to attend. Volunteer Ridgerunners engage hikers in friendly conversations about the natural and cultural significance of this area and tips on best practices for enjoying the Trail safely and responsibly. They report on trail conditions and perform light trail maintenance to prevent small problems from getting worse–like dismantling illegal fire rings, packing out trash, and blocking social trails to discourage shortcutting. In 2018, 38 Volunteer Ridgerunners logged 1,125 volunteer hours, spoke with over 18,000 visitors and removed 570 gallons of litter! Before approving the Mountain Valley Pipeline (MVP), the Federal Energy Regulatory Commission (FERC) had to show that it would do no substantial environmental harm, supposedly demonstrated in the Final Environmental Impact Statement (FEIS) they issued on June 23, 2017 (Accession No. 20170623-4000). 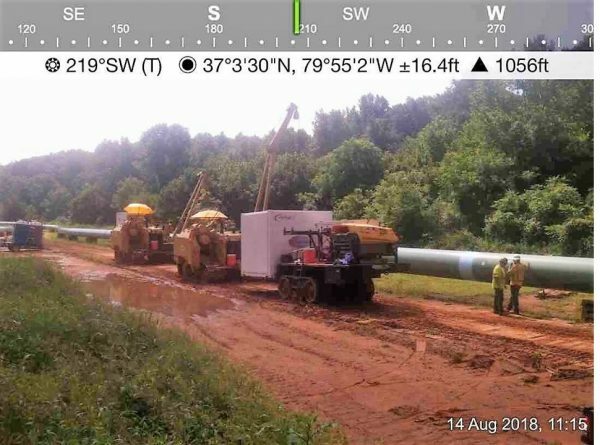 In granting the FEIS, the FERC relied on MVP’s stream scour and erosion analyses and plan containing specific information about pipeline construction at stream crossings along the entire pipeline route. Rejecting the expert’s directive that MVP do a site-specific analysis of every water body crossing on the route where MVP proposed to change its original plan. Allowing MVP to produce revised plans with lower environmental standards (June 2018). Failing to provide state environmental agencies or the public an opportunity to comment on revised plans. Approving, without opportunity for public comment, a project-wide variance (MVP-006) on September 26, 2018 that allows MVP to violate Best Management Practices without oversight. Producing this hasty variance approval at EXACTLY the same time that MVP announced a lengthy delay and major cost increase. MVP and its investors – not clean water, landowner rights and protection of public lands – seemed to be the core FERC audience for this action. Hiding the relevant correspondence from the public, the courts and both federal and state regulators. Trying to hide the name of the FERC Project Manager in documents that ICWA acquired through a Freedom of Information Act Request (FOIA). Many RATC members know Chris Means as RATC’s Membership Coordinator or as an early co-organizer of the Roanoke Outdoor Adventure Club. But there is a lot more to his story! Undoubtedly I had the most fun in my working life at a skate/T-shirt shop in the booming metropolis of Charleston, West Virginia. I of course never made much money at this and eventually moved on, but the atmosphere was fun, my co-workers were incredible, and the job was essentially easy as love mingling with the public. I recall this as the ‘good times’ era in my life. Fast forward 30 years and I find myself entertaining the possibility of doing something similar, but with more thoughtful motivation. Create and sell great quality products through his online shop. Get others addicted to the outdoors by any means possible. Vicariously will work, but my aim is to help others find the medicinal value I’ve stumbled onto out there, and if I’m really lucky, ignite a passion for conservation in a few individuals along the way. Generate enough income to keep this little venture solvent, and who knows, maybe even make a buck or two. Contribute a percentage of all profit funds to groups currently doing vital work out there conservation groups and other nonprofits. When asked why he started Outdrz.net, Chris said he was retrieving a part of his life that had slowly disappeared over the years. “I’d all but forgotten about walking in the woods,” he noted, even though he was a Boy Scout and grew up in a family of hunters who often wandered in the woods after a big meal to relax. He decided to make some changes. As I started easing back out into the woods I can’t really label or give a name to the feelings I started to recall and the level of serenity that slowly came over me as I’d just walk along and sort through things mentally. At this stage I don’t care to give this sensation a name or categorize it. I only care that I never lose the ability to be exposed to it, and I want it always to be available for anyone else who might draw the same experiences from a simple bit of time spent in the outdoors. As a species a lot of us humans appear to be in a constant battle to live up to or achieve the levels of suggested success that we’ve been fed and conditioned to understand as “correct.” Some examples: the $250k house, 2 vehicles, 3 kids and at least 2 household pets. Get, get, get; more more more and so on and so on. In my humble opinion I’ve heard it said best as “We will not understand as a people the value of the pristine outdoors until the last fish is gone, there are no more trees to cut down, and the forest animals have diminished, at which time we’ll come to realize that you cannot eat a $100 bill,” although I can’t remember who said this. RATC thanks him for his work on the AT and in the community. Check out his website and Facebook page! The volunteers of the Roanoke Appalachian Trail Club wish everyone a joyful holiday season! 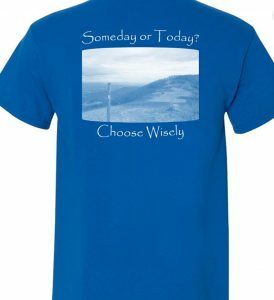 As part of the celebrations, RATC has added a new t-shirt to its store, honoring our section’s famed Triple Crown – Dragon’s Tooth, McAfee Knob and Tinker Cliffs. It can be ordered directly from the RATC store using this link and it comes in both red and green. 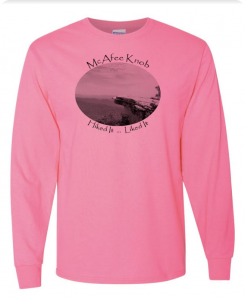 The back of the t-shirt, designed by RATC board member Chris Means, features the slogan, “Easy on the Eyes, Hard on the Thighs” and photos of Dragon’s Tooth, McAfee Knob and Tinker Cliffs. The front has the RATC logo, designed by long-time RATC member Zetta Campbell. It features a hiker on McAfee Knob and the year of the RATC’s founding – 1932. This is a great gift for anyone who has hiked the section or just loves the AT, and earnings go directly to the all-volunteer RATC, which maintains and protects over 120 miles of the AT in southwestern and central Virginia. We are one of 31 maintaining clubs along the AT and must earn all of our own funding. 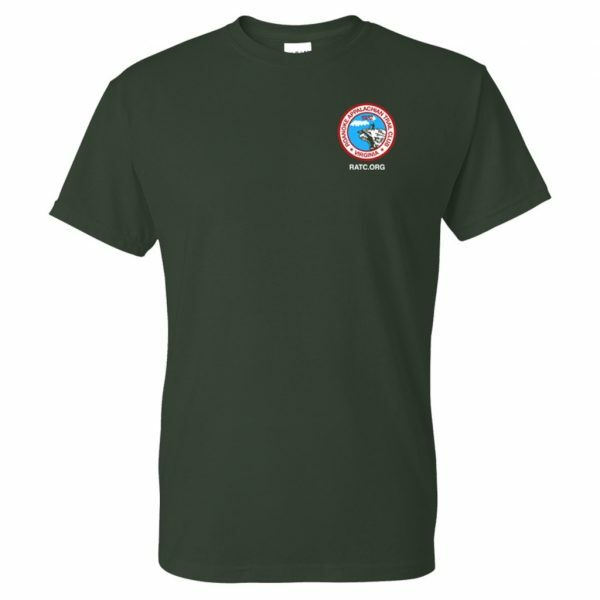 The store continues to offer regular RATC t-shirts and hats in several designs as well through our partners at Press Press Merch. 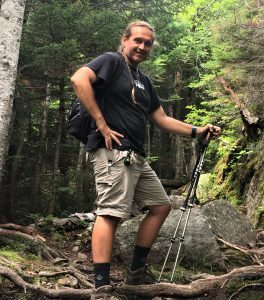 For those interested in hiking the section, this RATC website has an entire page devoted to the Triple Crown, with detailed maps and information about camping and other special rules on the section. See you on the Trail in 2019! In 2014, Mountain Valley Pipeline (MVP)/EQT confidently predicted they could build a 300+ mile pipeline through mountains and karst by late 2018 at a cost of less than $3.5 billion. Today they say they can finish by late 2019 at a cost of $4.6 billion. 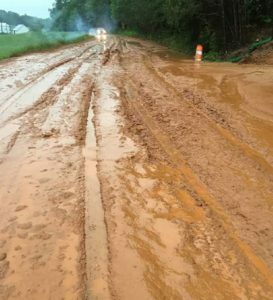 This update focuses on the situation in Jefferson National Forest (JNF), where construction is still halted due to a federal court decision in July. Experts in both government and the private sector have repeatedly filed reports showing that MVP’s plans for control of erosion and sedimentation would result in widespread damage and destruction, and these predictions were sadly correct, both inside and outside JNF. Recently released reports from the US Forest Service (FS) show dozens of serious failures in MVP’s erosion and sedimentation controls in JNF. These reports support original FS critiques that led to the 4th Circuit Court of Appeals stay on construction. MVP used extremely questionable methods based in part on work done in Florida to design their erosion and control strategies. Details are below under #3 and #4. The FS recently approved an MVP plan for Winter 2018-19 that does not allow any construction or burying of pipe and instead requires MVP to stabilize existing construction and plant seed on denuded areas by October 15. MVP had proposed burying pipe in the ground to prevent erosion! Details are below under #5. 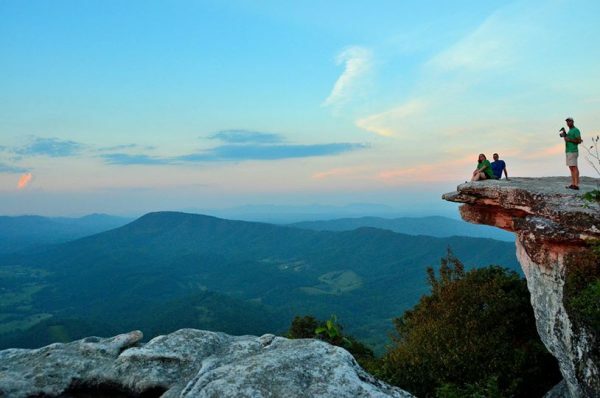 Have you hiked to McAfee Knob? If so, you probably had company! In fact, about 80,000 to 90,000 people a year hike to the Knob. Most of them have never been there. To help educate hikers on safety and Leave No Trace, the Roanoke Appalachian Trail Club has established a McAfee Knob Task Force of trained volunteers in concert with the Appalachian Trail Conservancy, National Park Service, US Forest Service and Roanoke County Fire and Rescue. One day of training and practice hike will make you good to go as a volunteer ridgerunners! HOW: For details and to sign up, contact Kathryn Herndon-Powell kherndon@appalachiantrail.org or call 540.904. OR join the RATC Meetup group www.meetup.com/Roanoke-Appalachian-Trail-Club and sign up there. 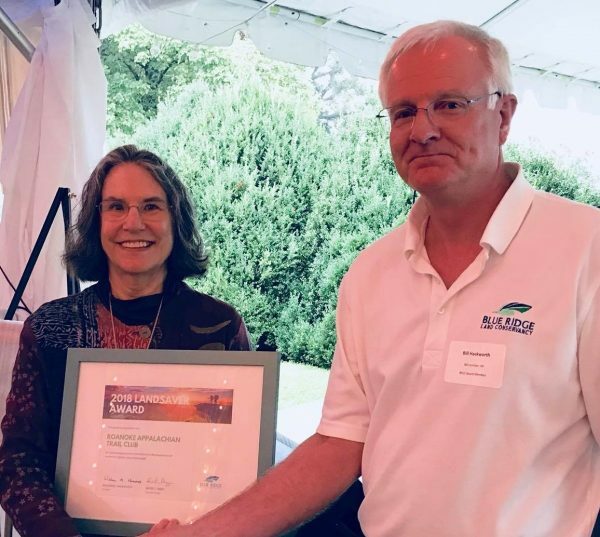 Past RATC president Diana Christopulos accepts Landsaver Award from Blue Ridge Land Conservancy President Bill Hackworth. In the backyard of the Blue Ridge runs the nation’s premier, continuous, long-distance footpath: the Appalachian National Scenic Trail, commonly referred to as the “AT.” With a length of 2,190 miles from Georgia to Maine that takes thru hikers from 4 to 7 months to complete, who takes care of this mammoth recreational gem? That’s where groups like the Roanoke Appalachian Trail Club step in. The recipient of this year’s Landsaver Award from the Blue Ridge Land Conservancy. the club was founded in 1932. It’s one of 31 similar clubs along the length of the AT, the purpose of which is to maintain, and address threat to the trail. This hard-working club oversees more than 120 miles of the trail between Bland County and Black Horse Gap in Virginia. Some volunteers walk a section assigned to them 4 times a year to monitor vegetation and pain the iconic white blazes. They do a great job, according to many thru-hikers. Jim Beeson, the current presidents of the club, completed the AT in 2016. For him, this area had some of the best parts of the trail in terms of maintenance and views. In fact, it encouraged him to join the club. Stop Work order? What’s a Stop Work order? THIS POST WILL BE UPDATED AS NEW EVENTS OCCUR. On July 27, 2018, a federal court ruled in favor of the Sierra Club and other plaintiffs that federal agencies (US Forest Service and Bureau of Land Management) had not properly examined Mountain Valley Pipeline’s proposal before issuing permits for its construction through Jefferson National Forest. The Federal Energy Regulatory Commission (FERC) then issued a Stop Work order but has since allowed Mountain Valley Pipeline to rewrite the Stop Work order TWICE, and encouraged the company to build over 100 miles of the pipeline as fast as possible. The court ruling directly affects the crest of Peters Mountain, where MVP proposes to bore under the Appalachian Trail, as well as construction areas where the pipeline route would have a significant impact on the AT off and on for about 100 miles. This blog aims give a little clarity to a very complicated process by giving the names, dates and basics of the situation as it unfolds. LINKS will take you to the original documents. HERE IS THE BASIC TIMELINE. IT WILL BE UPDATED AS EVENTS UNFOLD. August 14, 2018 MVP requests that FERC modify the Stop Work order again so they can continue with construction. They offer their own version of “Stop Work” order, which would allow construction of over 100 miles of pipeline plus compressor stations. Wednesday, August 15, 2018 Sierra Club and others file emergency legal challenge to FERC action in federal courts. Thursday, August 16, 2018 FERC again revises the Stop Work to suit the pipeline company and urges work to be done as fast as possible. Thursday, August 16, 2018 Market Watch reports that 50% of MVP workers have left the project and that earliest completion date is now 4th quarter of 2019. Natural Gas Intel makes same report.